With the arrival in Beijing this week of the United States’ top trade negotiators, you might think that the U.S. and China are about to enter high-level talks to avoid a trade war and that this is a story for the business pages. Think again. This is one for the history books. Five days of meetings in Beijing with Chinese, U.S. and European government officials and business leaders made it crystal clear to me that what’s going on right now is nothing less than a struggle to redefine the rules governing the economic and power relations of the world’s oldest and newest superpowers — the United States and China. This is not a trade tiff. In one corner stand President Donald Trump and his team of China trade hard-liners, whose instinct is basically right: This is a fight worth having now, before it is too late, before China gets too big. And in the other corner stands President Xi Jinping of China, whose instinct may also be right — this is a fight worth having now, because it is too late — China is just too big. Or, as one Chinese expert put it at a Tsinghua University dialogue on trade I attended, “No one can contain China anymore.” You hear that confidence in Beijing a lot today from Chinese: Our one-party system and unified society can take the pain of a trade war far longer than you Americans can. And there is a trade imbalance today because we’ve been investing in our future and you Americans have been eating yours. Here’s how we got here: In Act 1, U.S.-China relations were all geopolitics, with the U.S. and China against the Soviet Union. That lasted until the late 1970s, when Act 2 began: China shifted toward capitalism, becoming a huge factory and new market — and 30 years later turned into the world’s second-largest economy. In large part this was due to the work ethic of the Chinese people, the long-term thinking of China’s leaders and the government’s massive investments in infrastructure and education. But in part it was also due to China’s willingness and ability to bend or ignore rules of the World Trade Organization and, at times, outright cheat. In some cases China used industrial espionage to just steal innovations from the West. Other moves were more subtle: When China joined the WTO in 2001, it was allowed in as a “developing nation,” subject to very low tariffs on its exports to our country but permitted to impose high tariffs to protect its own rising industries from U.S. and European competition. The assumption was that as China grew, and the WTO moved to a new regime, China would quickly cut its tariffs — like its 25 percent tax on car imports, compared with the 2.5 percent tariff imposed by the U.S. But the WTO still has not completed a new trade round and China has refused to voluntarily lower its tariffs. Moreover, China developed an industrial policy that often bent WTO rules. The government gave away cheap land, and state-guided banks granted cheap loans for new industries, but foreign companies that wanted access to China’s market were forced to pay to play — to have a Chinese partner and be willing to transfer their advanced technology to them. Even when the U.S. protested to the WTO — as in the case of how China unfairly kept U.S. credit card companies out, then lost the arbitration case at the WTO — China still dragged its feet before following through on promises made 17 years earlier to open up. By then, Chinese companies, like UnionPay, so dominated China’s credit card market that U.S. companies, like Visa, were left with the crumbs. Meanwhile, Chinese government-guided companies and investment funds went abroad and began to buy up strategic industries to bring their technology back to China — like Germany’s biggest and best robotics company, Kuka. U.S. and European businesses tolerated all of this because they were still making money in China or were afraid to be frozen out of its massive, growing market — until a couple years ago, when more and more told their governments: This is not working anymore. That ushered in Act 3. Act 3 opened in October 2015, when China announced its new long-term vision: Made in China 2025, a plan to dominate 10 next-generation industries, including robotics, self-driving cars, electric vehicles, artificial intelligence, biotech and aerospace. And I heard this as much from EU officials as U.S. ones. That is why many EU countries are scrambling to pass laws to prevent China from buying up their most advanced industries. And that is why China is telling EU countries, as one EU official put it, “Whatever you do, don’t join the U.S. camp” on trade. The last thing Beijing wants is a U.S.-EU united front demanding it play fair. Don’t get me wrong. I am a free trader and genuinely not afraid of some state-directed 2025 plan beating Western free-market innovators. I welcome China focusing more on 21st-century industries. It could be better for everyone. Economics is not like war — they can win and we can win. On one condition — we all play by the same rules: hard work and innovation, not hard work and stealing intellectual property, massive government interventions, ignoring WTO rules, lack of reciprocity and forcing Western companies to pay to play inside China. That is what this moment is about — that’s why it’s a fight worth having. Don’t let the fact that Trump is leading the charge distract from the vital importance of the U.S., Europe and China all agreeing on the same rules for 2025 — before it really is too late. Have no doubt, though: Both Trump and Xi are approaching this moment with enormously high-risk strategies. At a time when we are at a historic juncture in defining the West’s economic relations with China — clearly our No. 1 priority — Trump is also risking a trade war with the very allies we need to move China in the right direction — Japan, South Korea, Europe and Canada — by threatening them with steel and aluminum tariffs if they don’t meet his demands. Trump seems to believe that he can reshape how China approaches the next era of global trade without allies — just American brute force. Good luck with that. Worse, Trump tore up the Trans-Pacific Partnership, which would have brought together the most powerful economies on the Pacific Rim around a set of trade rules perfectly aligned with U.S. interests and focused on all those things, like intellectual property, that we want China to embrace as it moves to 2025. In short, with a lot of allies in Europe and on the Pacific, we might be able to move China in the right direction. But Trump is alienating them all. How foolish is that? Trump also has nothing to say about investing in the real source of long-term U.S. strength — infrastructure and education. But Xi’s bet is also no slam dunk. China is a much more open country today than it was 25 years ago — but it’s also much less open than it was five years ago. Xi’s allies argue that his crackdown on corruption; his repeal of term limits, which positions him to rule for what could be decades; and his tightening of the control that the Communist Party wields over every institution were urgent because collective rule did not work. China’s society, government and military were being eaten away by corruption from within, those allies say. That may have been true. But creating a regime of one-man rule; controlling the internet, free speech and universities more tightly than ever; and resurrecting the teaching of Marxist thought cannot be the best way to stimulate and attract the most creative and innovative minds that China needs to propel a startup economy and deliver on Made in China 2025. Will China’s best and brightest want to work in such a system? I don’t know. China’s autocracy has managed to produce a tremendous number of patents and startups so far, so maybe Xi can pull this off. But it’s a big bet. As I said, this is not just a front-page business news story. What’s being written is the first page of a whole new chapter in the history of U.S.-China relations. And how it gets written and how it ends will shape the Trump and Xi legacies — and touch every major economy in the world. 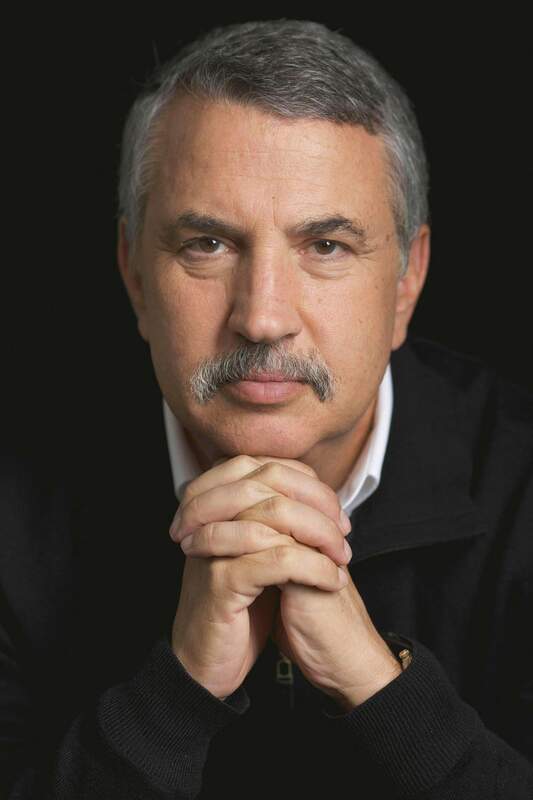 Thomas Friedman is a columnist for The New York Times. Reach him c/o The New York Times, Editorial Department, 620 8th Ave., New York, NY 10018. © 2018 New York Times News Service.